LILLE, FRANCE – Ethan Cochran had the throw of his life to improve his personal best in the discus by three meters and win the silver medal during day one of the 2011 IAAF World Youth Championships held in Lille, France, July 6-10. 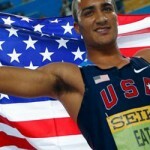 Cochran (Costa Mesa, Calif.) twice bested his previous personal record in the discus with two throws over 60 meters. After fouling his first attempt, he first set a PR on his second attempt where he recorded a 60.37m/198-0 heave. He then followed up with his medal-winning third throw of 61.37m/201-4. While he did not improve his mark during the next three throws, it was good enough to hold off the rest of the field who sat more than half a meter behind him. Haley Crouser (Gresham, Ore.) didn’t spend much time at the track on day one. On her first throw of the competition, she sent the javelin flying past the qualification mark of 50m. Recording a toss of 50.60m/166-0, Crouser automatically qualified for the final and was done for the day. Jennifer Madu (Murphy, Texas) ran a quick round in the girls’ 100m to win her heat in 11.79, while Myasia Jacobs (Paterson, N.J.) also advanced by winning her heat in 11.85. Amber Bryant-Brock (Marietta, Ga.) and Nnenya Hailey (Marietta, Ga.) brought more wins in the girls’ 400m hurdles. Bryant-Brock won the first heat in 1:01.13 to automatically qualify for the semifinals, and Hailey speed to a 58.71 to win her win her heat and qualify as well. In the boys’ 400m hurdles, Jonathan Russell (Ashburn, Va.) came over the final hurdle side-by-side with three other athletes. In a sprint to the finish, Russell was narrowly edged out by Yahaya Ibrahim Barnawai; however, all of the top three ran to personal bests. Russell advanced to the finals with his quick time of 51.94. In the first final of the championships, Torrie Owers (Athens, Ga.) threw her best mark of 14.40m/47-3 on her second attempt in the shot put. Owers’ first international competition capped off a successful year in which she improved her previous year’s best mark by more than 10 feet. 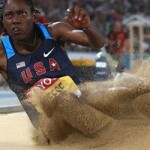 Team USA did not advance to the finals of the triple jump. Carla Forbes (Mattapan, Mass.) leapt to a 12.12m/39-9.25 on her first jump to record her best mark and give her 13th place of the first group. Madu finished tenth in the second group with her first and best jump of 12.42m/40-9. Team USA sailed through the morning qualifying rounds on the track with all seven athletes in running events advancing to the next round. Team USA started on the right foot in the girls’ 100m hurdles with both athletes advancing to the next round. Trinity Wilson (Oakland, Calif.) won the first race of the meet by taking heat one in 13.59. Kendell Williams (Marietta, Ga.) also nabbed first in the fourth heat in 13.60. In the boys’ 800m run, Cameron Thornton (Atlanta, Ga.) looked effortless after he negotiated the traffic of the field and passed on the outside. Thornton took second in his heat in 1:52.34. Tre’tez Kinnaird (Louisville, Ky.) finished fourth in his heat, but was able to advance to the semi-finals with his time of 1:52.81. In the girls’ 1500m, Hannah Meier (Gross Pointe Farms, Mich.) had a strong finish in the first heat to take third place in 4:25.28. Camille Chapus (Pacific Palisades, Calif.) faced a fast field and rode the pack to a personal best finish of 4:22.69 to take sixth and advance to the finals based on time. Reigning Youth Olympic champ Robin Reynolds (Miami, Fla.) ran to an easy win in the fourth heat of the girls’ 400m. Reynolds won in 54.59 to automatically advance to the semifinals. Kendall Baisden (Franklin, Mich.) was faced with a lane eight draw for the first time, but was able to overcome the position to finish second in her heat in 55.58 to advance as well. Ronald Darby (Oxon Hill, Md. ), the only U.S. entrant in the boys’ 100m, and he represented his team well as he pulled away from the rest of heat six to win in 10.67 and automatically qualify for the semi-finals. In the qualifications for the boys’ discus, Ethan Cochran fouled on his first and last throws, but thankfully he lobbed the disc 57.13m/187-5 on his second throw to advance to the finals. In the qualification for the girls’ shot, Owers sent her final toss flying 14.13m/46-4.25 to secure her fourth place and an automatic qualification to the final. Chamaya Turner (Garden Ridge, Texas) also threw her best mark of 13.20m/43-3.75 on her final attempt; however, she did not advance to the finals.